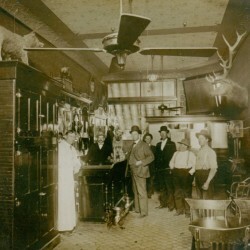 In 1907, the Mint Bar (then called the Mint Saloon) opened for business in the heart of downtown Sheridan. At that time, ice was delivered in horse-drawn wagons to the bar’s ice box and bartenders wore long white aprons, serving drinks across a mahogany bar. The first operators of the Mint Bar were Charles Marlow and Celar Gebo – Marlow left in 1915.